awesome! They look perfectly done! love anchors! great choice sweets. These are so cool! They look perfect! You did an amazing job. I love black and white stripes. Have a great weekend, Erica! These look fun..I'm gonna go check them out!! I officially LOVE this look! Wow, they look fun. I have always seen them in the store but never thought about actually using them, they look great on you! fun nailpolish! 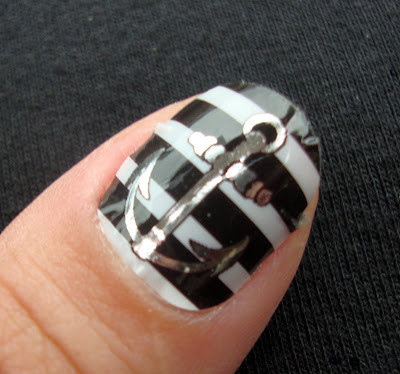 i want the anchor without the stripes..or navy stripes.